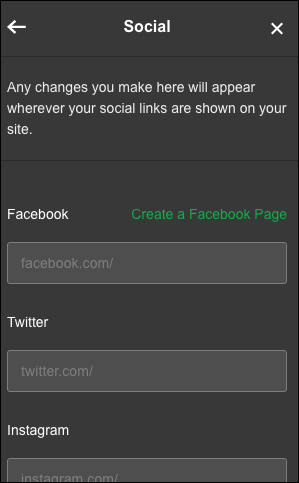 By adding a Social section to your site, you can add button links to your social media accounts. Options include Facebook, Twitter, Instagram, Pinterest, LinkedIn, YouTube, and Google+. Scroll to where you want to add a section and click the plus button. Click Social panel in Add Section panel. Click the row of small social buttons to add the Social section. When the Section Added confirmation appears, click the Social section to begin adding links to your various social media accounts.